Origin and Habitat: Cape Province (Ladismith area between Groot River and Trumpeter's Poort), South Africa. Habitat: It grow in rocky quartz fields and on steep, shady quartzitic sandstone cliffs where they have excellent drainage provided by very porous soil. 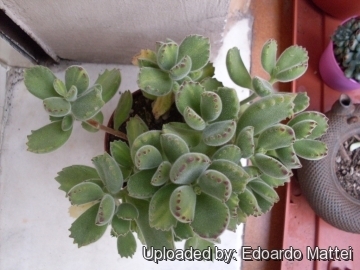 Cotyledon tomentosa f. variegata hort. 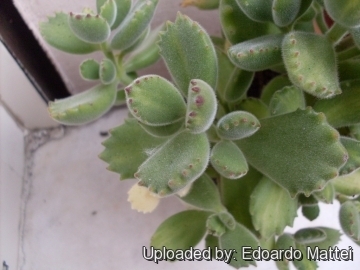 Cotyledon tomentosa subs. ladismithiensis f. variegata hort. 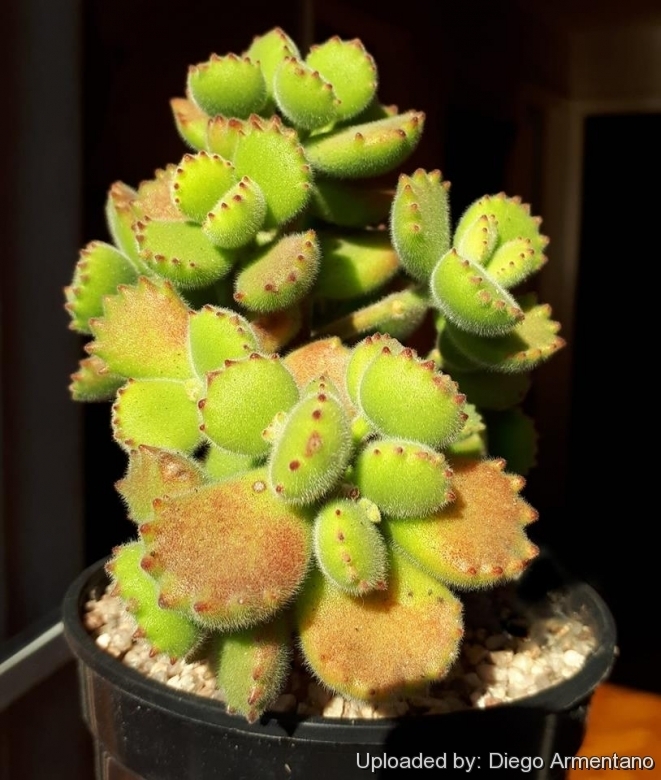 Description: Cotyledon tomentosa (Bear's Paw or Kitten Paw), is a succulent shrublet native to Africa that can rich a height of 30-70 centimetres and a diameter of 30-50 cm, more or less densely branched. Like all tomentose plants this has leaves, flowers and stems all covered with down. The leaves, grape- to thumb-sized, feel fat and soft to the touch just like the little paddy paws of a baby animal, complete with red toe-nails It forms large orange bell-shaped flowers in spring. Stems: Thin, 3-4 mm in diameter, set loosely 10-15 (or more) cm. long, tomentose to pilose, branching profusely near ground level. Leaves: Plump, soft, ± opposite, decussate, and densely clothed with woolly hairs, obovate oblong, oblanceolate to oblong-elliptic, cuneate, 1.5-5.5 cm long and 8-15 cm broad, convex, tapered to a short stalk at the base, apex scalloped with prominent dark red "teeth" at tips. These teeth are arranged in a neat row and vary in number between three and ten. There are bright green or yellow-green leaf forms with yellowish hairs, as well as grey ones with whitish hairs covering the leaves. Inflorescence: The inflorescence is a thyrse with 1-3 dichasia, with 10—20 nodding florets; peduncle 0,15-0,25 m long, densely hairy. Scape slender, covered with a dense felt of hairs, 10—20 cm. long. Flowers: Red to almost yellow typical Cotyledon urn-shaped with five petals that separate near the tips to curl back at the mouth, usually pointing outwards on quite short pedicels . Sepals triangular, 3-5 mm long, bluntly acute, densely felted. Corolla tube vaguely ampullaceous to cylindrical, 12-16 mm with recurved-spreading lobes half as long, hairy outside, glabrous within except for tuft of hairs where filaments are fused to tube. Stamens 10, anthers 1.5-1.8 mm long. Squamae transversely oblong, 0.5-1 x 1.3-1.6 mm, slightly emarginate, pale yellow. Cotyledon tomentosa Harv. : has leaves, flowers and stems all covered with down. Leaves scalloped with 3 to 10 prominent dark red "teeth" at tips. Distribution: From Groot River to Trumpeter's Poort. 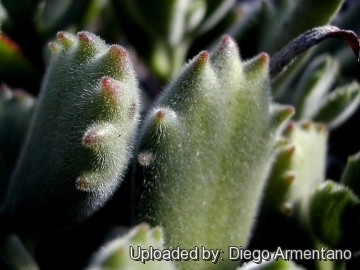 Cotyledon tomentosa subs. ladismithiensis (Poelln.) Toelken: has stronger branches to 1 m tall. Leaves oblong-elliptic with 1 to 3 (or more) sharp apical teeth and pendulous red flowers. Distribution: Ladismith and Laingsburg. 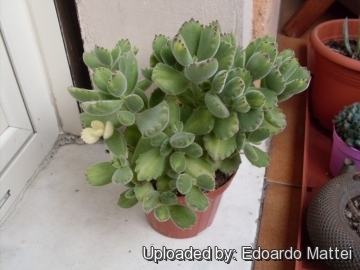 Cotyledon tomentosa subs. ladismithiensis f. variegata hort. : has creamy-yellow patches on foliage and few pointed teeth on leaves tips. Cotyledon tomentosa f. variegata hort. : has cream patches on foliage, usually around edges and up to 10 red teeth in a line on leaves tips. Cultivation and Propagation: Cotyledon tomentosa is a relatively commonly sold plant at garden outlet nurseries, and can make a nice low succulent shrublet in the garden, does well in containers, and makes a good houseplant. It is widely grown and not difficult to cultivate. Cotyledons are very responsive to differing cultural conditions both as regards colour, length and shape of leaves, rate of growth and size of plant. They are dormant in summer and thrive with bright light and ample airflow. Watering Needs: It is a very dry-tolerant plant. Water regularly in the growing season, but avoid water-logging and let dry between waterings. Water with caution in winter, as the plant can lose its roots if the soil stays cold and wet for extended periods. If grown in a container, bottom watering by immersing the container is recommended. It must have very dry atmosphere. Sun Exposure: Does well in full sun, but can handle some shade, too. In shade the leaves colour will remain more green, while in harsh full sun conditions the foliage can develop a pale yellowish tinge. In summer keep cool and provide some shelter from direct sun during the hottest hours. It can be sunburned if moved from shade/greenhouse into full sun too quickly. It tends to get really leggy in deep shade). Frost Tolerance: Protect from frost to prevent scarring. It requires a minimum temperature of about 5°C, but will take a light frost and is hardy down to -5° C for short periods if it is in dry soil (Lethal temperature in habitat -6 to -10 ° Celsius). USDA zones 9A – 11. In areas prone to frost, grow in an intermediate greenhouse or conservatory, in pots.